Since HIV and AIDS was first reported over thirty years ago, it quickly became one of the leading causes of death worldwide. The epidemic had a particularly damaging effect on the social and economic fabric of Malawi. Infections rates rose, hundreds of thousands died, children were orphaned, and no one wanted to discuss the disease—especially not in a society where those infected faced severe stigma and discrimination. The Ekwendeni Hospital AIDS program (EHAP) began in 1989 and has been working with Presbyterian World Service & Development (PWS&D) for over two decades to break down barriers to prevention and support people whose lives are affected by HIV and AIDS. Together, EHAP and PWS&D have undertaken initiatives that actively fight against the spread of HIV, emphasize human rights and the role of men, as well as provide compassionate care and medicine to people living with the disease. Programs work towards a world where orphans receive both emotional support and the opportunity to go to school, and where mothers no longer transmit HIV to their babies. Today, the HIV infection rate in Ekwendeni is eight per cent—compared to 12 per cent nationally—and only two of 92 babies became infected during childbirth last year. 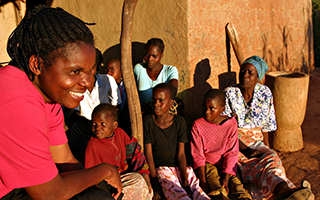 Esther shared that these successes have led the government of Malawi to use Ekwendeni’s AIDS program as a model for similar programs in the country. There is hope in Ekwendeni. Esther will be the first to say, “all of these achievements come from what people contribute,” whether it is the daily efforts of EHAP staff and community volunteers, or the financial gifts of Canadians here at home. In Malawi, the tide is turning against HIV and AIDS. More people than ever are accessing treatment, lives are being lived with dignity and the number of people dying from AIDS related causes are decreasing. 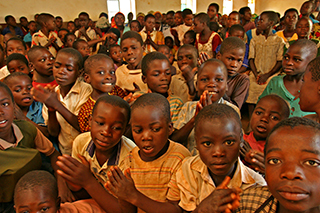 By giving support to orphans now, they are empowered to contribute to a healthier, whole Malawi. The results we see today are made possible through the faithfulness of Presbyterians, who eight years ago responded to an appeal from the 130th General Assembly of The Presbyterian Church in Canada to help tackle HIV and AIDS around the world. At that time, the appeal raised $1.6 million. Although the tide is turning, many challenges remain. Please keep in prayer those whose lives are affected. Talk about AIDS with family and friends. Inspire others to learn more about AIDS. Help ensure this reversal continues by raising funds for PWS&D’s HIV and AIDS programs around the world. Together we can turn the tide.